-Those little plastic connector string-thingies that attach price tags to clothing and that you have to cut off, thereby sending the little "T" ends flying to places where you (inexplicably) cannot find them. -The belief that there is always one more application in the toothpaste tube, inevitably resulting in toothpaste tube torture. -The washing* of soiled Tupperware containers, which isn't so bad but always requires the drying of said containers, which is nearly impossible due to all the little ridges and grooves (particularly in the lids) where droplets of water cling and that require the person drying to fold up the towel and then manipulate it into the offending crevices. 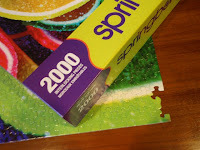 -Missing puzzle pieces, particularly on brand SPANKING new 2,000-piece Springbok puzzles, which are effectively reduced to 1,999 pieces and rendered infinitely less valuable than their pristine counterparts. -The last remaining crumbs in the potato chip bag, particularly when one's Dearly Beloved straightens the bag, thereby creating a "taut" corner, which he then upends into his mouth, but due to some unidentifiable miscalculation (perhaps operator error in bag-straightening or excessive crumb velocity due to misjudged bag upending speed), scatters the remaining potato chip crumbs into an array of places including but not limited to: his mouth (45%), his face (30%), and upon the floor and/or into the unnavigable landscape of his easy chair (25%). -Instant lottery ticket scratch-off turds (which are admittedly less irritating when the lottery ticket yields winnings). *applies to both manual and automatic efforts. I no longer have to suffer in silence. Those plastic "Ts" are the bane of my existence. I now very deliberately remove them over a flat, clear surface so as to have the remains fall where I can retrieve them. Still not foolproof. I thought I was the only one who got annoyed by those plastic 'Ts'!!! An add on to that, how you go to pull them off your new garment and it gets stuck on a peice of string and ends up putting a whole in the item you just purchased! 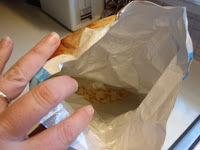 There is absolutely no fool-proof way to extract the remaining crumbs and crackles from the bottom of a bag o' chips. But really...aren't they the tastiest bits? Much like the "bonus" fries at the bottom of a McDonald's sack and the brownie batter that clings to the sides of a mixing bowl, I often prefer the remnants to the actual item. When those crumbs end up in between the couch cushions? Not good. Not good at all. And what about when the tag string T has somehow been attached to an inaccessible area, like when the T part is INSIDE a seam and you can't get it out? GRRR! those "t" ends? easy to find. walk around barefoot. my word verification is "sklessed", which i think i'll use as a new epithet when finding sharp things with my feet! I like when they hide in the inaccessible areas and announce themselves by scratching at the skin, usually when one is in a place where tearing at one's clothes just isn't acceptable. 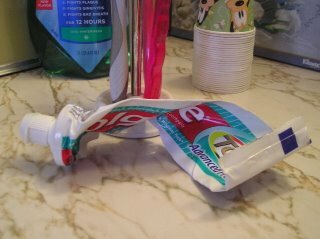 ...and why is it that toothpaste never gets on the shopping list before the tube-wrestling begins? I always feel like I've failed when I throw away a toothpaste tube, KNOWING there is just one more use trapped inside...haha and my word verification is criers. My husband is restricted to living at the kitchen table, where cleanup is much easier. We should start a word verification dictionary. solution for "T's": I buy my clothes from the thrift store. solution for toothpaste waste: I buy the little plastic bottles. 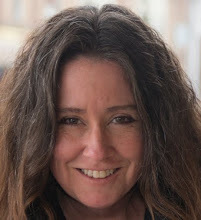 I look like a homeless guy satisfied with the knowledge that I didn't throw away a little toothpaste. I do the same thing with my potato crisp crumbs. Oh, thank God, it isn't just me that's less than tickled by irritables. To me, the last bits and pieces at the bottom of the bag of [insert snack here] are the tastiest. It's usually mostly leftover [insert artificial powder/flavoring here] with a few actual crumbs scattered about. My favorite bowl of Frosted Flakes is the last bowl of Frosted Flakes. I enjoy tremendously, how you think. The intrusive clanking of someone over-zealously stirring their coffee. Sends shivers down my spine that cause my fists to clench and teeth to grind. Even my favorite New 2 U shop utilizes the dreaded plastic Ts. The last episode in what had been a successful TV series. Seinfeld, The Sopranos come to mind. and then there's those nailpolish bottles. Has anyone figured how to use up an entire bottle of nailpolish? I love it! So funny and true!! !